I love December! As the last month of the year, it’s the perfect time to sit down and really reflect on the past eleven months so that we can plan for the New Year. I don’t want to wait until January to start doing all of this … January is go time! It’s time to start implementing our vision boards. What worked this year? What didn’t? As the year draws to a close, how do you feel? If you are thanking the stars that 2018 is in the books, what can you change so that this time, in one year from today, you’re shouting “Heck yeah, I crushed it in 2019!” from the rooftops. One of my favorite sayings is, “little by little, a little becomes a lot.” What do you wish you started one year ago, and where would you be now? Have you always wanted to get your real estate license? Go back to school? Finally start that clean eating and meal prepping you’ve been talking about? Walking? Running? Doing yoga? 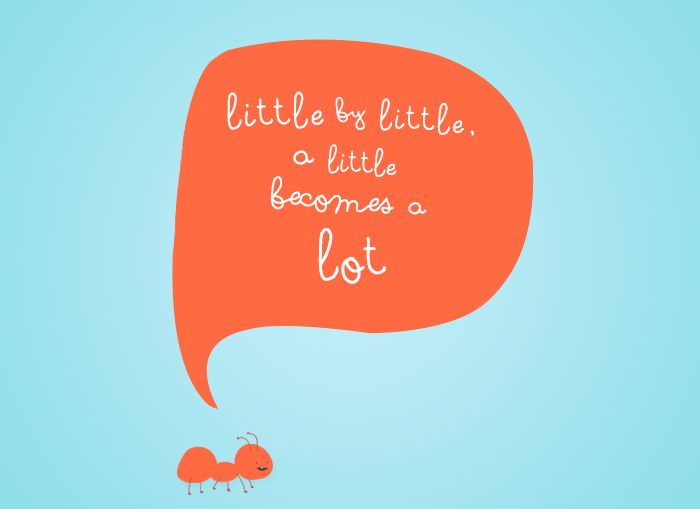 It might seem overwhelming, but little by little, a little becomes a lot. Great change never happens instantly. The best things in life require hard work, perseverance, and the dedication to know in your heart that it will happen if you just keep working at it. Promise me that the first thing you should implement in 2019 (and literally start right this second) is the power of positivity. Remind yourself every single day how amazing you are. Sure, no one is perfect, and we all strive to be better, to do better, but we must also give ourselves grace and commend ourselves for all the fantastic badass things we are doing. Maybe it’s more time with your spouse. When our kids were little, (2, 3, & 4) I had a high school neighbor kid come over every Monday from 4-7 and watch the kids. They had a blast because he played games with them, knew the words to every Disney song, and truly was present with them. And I loved it because I knew that no matter what, I could take a few hours to just be with Nick. Sometimes we’d even just go to Costco without the kids, or walk on the beach, pack a picnic, go to dinner, see a movie… Anything. When we got home the kids would be sleeping (I know, miracle right!) and we’d give them kisses and then have another two hours to spend time together. There was no dinner or bedtime struggle. It was time I could count on, and it was the best. I still don’t know what I want out of 2019. Sometimes figuring it out is the hard part. I do know that I want to be more present. I want to put down my phone and listen to my kids. Really hear what they are saying, without multitasking, checking emails, scheduling, or searching through Facebook. So on that note … I’m out. Happy December. Happy 2018. Cheers to getting everything you want and hope for in the new year.